Jinyong Wang, Ph.D., joined GIBH-Chinese Academy of Sciences in 2012.He is principal investigator of Blood & Immune Cell Regeneration Lab. His group made contributions in generating functional T cells from B cells or pluripotent stem cells. We focus on regeneration of hematopoietic and immune cells, especially T cells, through either reprogramming of B cells or directed differentiation of pluripotent stem cells. Since microenvironment is of great importance for hematopoiesis, we also investigate how to restore bone marrow microenvironment in hematologic malignancies. 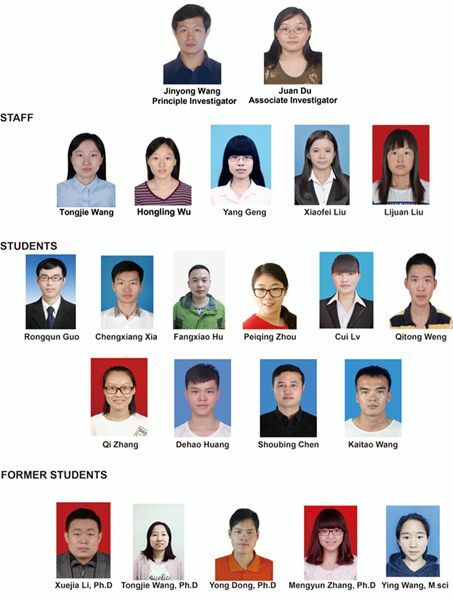 Zhang, M., Y. Dong, F. Hu, D. Yang, Q. Zhao, C. Lv, Y. Wang, C. Xia, Q. Weng, X. Liu, C. Li, P. Zhou, T. Wang, Y. Guan, R. Guo, L. Liu, Y. Geng, H. Wu, J. Du, Z. Hu, S. Xu, J. Chen, A. He, B. Liu, D. Wang, Y. G. Yang and J. Wang (2018). "Transcription factor Hoxb5 reprograms B cells into functional T lymphocytes." Nature Immunology,19(3): 279-290. Li, X., C. Xia, T. Wang, L. Liu, Q. Zhao, D. Yang, F. Hu, M. Zhang, K. Huang, Y. Geng, Y. Zheng, Y. Guan, H. Wu, X. Chen, G. Pan, J. Chen, J. Du and J. Wang (2017). "Pyrimidoindole derivative UM171 enhances derivation of hematopoietic progenitor cells from human pluripotent stem cells." Stem Cell Research, 21: 32-39. Chen, X., Q. Zhao, C. Li, Y. Geng, K. Huang, J. Zhang, X. Wang, J. Yang, T. Wang, C. Xia, X. Liu, M. Meng, D. Yang, Y. Zheng, J. Du, X. Zhang, J. Chen, G. Pan and J. Wang (2015). "OP9-Lhx2 stromal cells facilitate derivation of hematopoietic progenitors both in vitro and in vivo." Stem Cell Research, 15(2): 395-402. Wang, T., C. Li, C. Xia, Y. Dong, D. Yang, Y. Geng, J. Cai, J. Zhang, X. Zhang and J. Wang (2015). "Oncogenic NRAS hyper-activates multiple pathways in human cord blood stem/progenitor cells and promotes myelomonocytic proliferation in vivo." American Journal of Translational Research, 7(10): 1963-1973. Yang, D., X. Zhang, Y. Dong, X. Liu, T. Wang, X. Wang, Y. Geng, S. Fang, Y. Zheng, X. Chen, J. Chen, G. Pan and J. Wang (2015). "Enforced expression of Hoxa5 in haematopoietic stem cells leads to aberrant erythropoiesis in vivo." Cell Cycle, 14(4): 612-620. Wang, J., G. Kong, Y. Liu, J. Du, Y. I. Chang, S. R. Tey, X. Zhang, E. A. Ranheim, M. K. Saba-El-Leil, S. Meloche, A. Damnernsawad, J. Zhang and J. Zhang (2013). "Nras(G12D/+) promotes leukemogenesis by aberrantly regulating hematopoietic stem cell functions." Blood, 121(26): 5203-5207. Wang, J., Y. Liu, Z. Li, Z. Wang, L. X. Tan, M. J. Ryu, B. Meline, J. Du, K. H. Young, E. Ranheim, Q. Chang and J. Zhang (2011). "Endogenous oncogenic Nras mutation initiates hematopoietic malignancies in a dose- and cell type-dependent manner." Blood, 118(2): 368-379. Wang, J., Y. Liu, Z. Li, J. Du, M. J. Ryu, P. R. Taylor, M. D. Fleming, K. H. Young, H. Pitot and J. Zhang (2010). "Endogenous oncogenic Nras mutation promotes aberrant GM-CSF signaling in granulocytic/monocytic precursors in a murine model of chronic myelomonocytic leukemia." Blood, 116(26): 5991-6002.